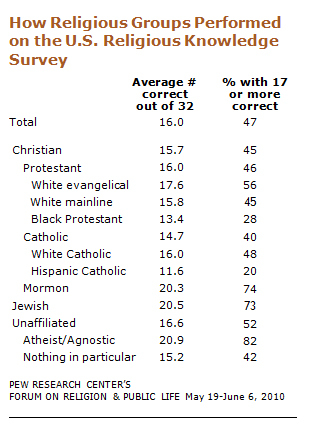 A Pew Survey from 2010 seems to indicate that this could be the case, with the atheist/agnostic group outscoring all others on a 32-question quiz of religious knowledge. Obviously, this lone survey hardly constitutes definitive evidence, and could be skewed by confining its sample to the United States. I've been trying to look deeper into this, but cannot find much more than anecdotes and conjecture. Have there been other similar studies/surveys done worldwide? Of course there is not likely ever to be a definitive yes/no answer to a question such as this, but statistically, among the general public: have those who self-identify as atheists been shown to consistently demonstrate a greater knowledge of religion than those who identify themselves as believers? Someone pointed out that the answer was in your question. But do you really mean, "Do atheists have a better knowledge of religion than believers, all other factors being equal?". What if atheists have a better knowledge of many things than beleivers, because they tend to be better educated. Your figures also showed Mormons and Jews to be exceptionally knowledgeable. Perhaps they too tend to be better educated? Data from the survey indicate that educational attainment – how much schooling an individual has completed – is the single best predictor of religious knowledge. Not the answer you're looking for? Browse other questions tagged religion sociology .